Jax is very pleased to be a part of this initiative. In California, Orange County Parks (OC Parks) has been selected to receive up to $10,000 in assistance through IMBA’s Bike Park Initiative to develop new bike facilities at Ted Craig Regional Park, in Fullerton. The facility will also receive a further $10,000 through a matching grant from OC Parks. Along with OC Parks, key partners in this initiative includes local IMBA chapter SHARE-MTB and Jax Bicycle Center, a chain of eight bicycle retail outlets throughout southern California. The Bike Park Initiative is an IMBA-led project designed to foster the development of world-class bike park facilities across the United States. 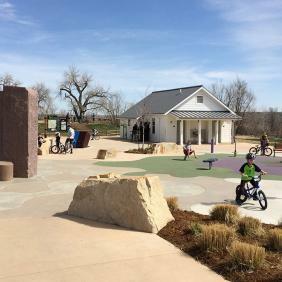 Developed in partnership with the SRAM Cycling Fund and People for Bikes, the Bike Park Initiative identifies promising local government agencies and provides them with strategic and technical assistance to create outstanding bike parks, including progressive jump lines, skills areas and pumptracks. The Bike Park Initiative will provide up to $10,000 in planning and design services, which will be matched by cash from OC Parks. The total of $20,000 will be used to create a detailed site plan and report for the proposed bike park at Ted Craig Regional Park. The funds will also be used to advise the applicant on the unique aspects of constructing and maintaining a bike park, including working with the local mountain bicycling community. The intent of this effort is to get high-quality projects initiated through professional design assistance so that the applicant, in conjunction with IMBA’s advocacy network, can quickly proceed through permitting and toward construction. Ted Craig Regional Park is one of four sites that were assessed by Trail Specialists from the IMBA Trail Solutions program in fall 2013, with OC Parks staff narrowing in on this location for a more detailed design.